Is It Good? Superman/Wonder Woman Annual #1 – AiPT! Charles Soule continues to step up his game in the first Superman/Wonder Woman Annual which also acts as a continuation of the Doomed crossover event. 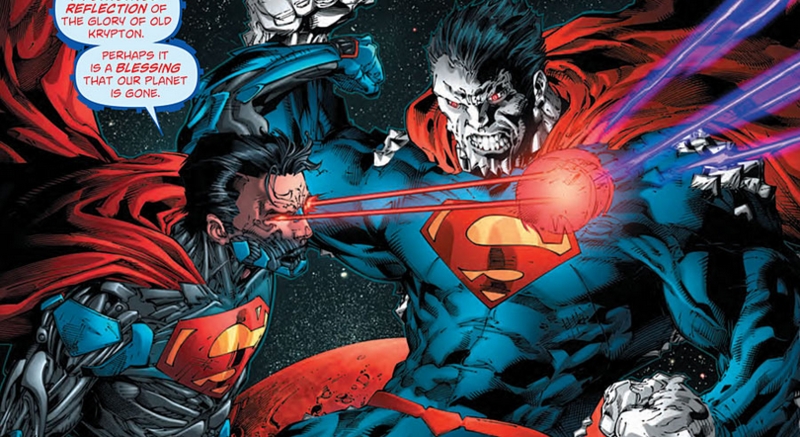 For those of you who haven’t been following this event, here’s where we’re at: Superman tried destroying Doomsday, but got infected and is now in the midst of transforming into a Doomsday-esque figure. To save the world from himself, Superman decides to fly off into space to mope (it’s actually a very courageous thing Superman, you do you buddy). Meanwhile Brainiac is launching a full scale attack on earth while his right hand man, Cyborg Superman, watches from above. Let me start off by saying that this issue is more of a Justice League issue starring Wonder Woman and Superman, than it is a Superman/Wonder Woman comic. Because the AI assault is a global affair, you’ll see cameos from the entire league as well as other members of the DC universe such as Swamp Thing, Hawkman, the Teen Titans, etc. Their spotlights are brief, but it’s always nice to see other DC heroes interacting. There’s also a good amount of panels featuring Steel who has become a major character throughout this Doomed story arc. Steel is one of my DC guilty pleasures and besides this and a short lived appearance in Suicide Squad, he hasn’t been given any opportunities to show how awesome his character can truly be (Take note DC). But I digress. This issue belongs to the power couple and features a climatic end to their relationship problems (Their problems being the fact he’s all spikey and bad tempered). We actually do get to see the two collide in battle as well which I’m sure everyone has been waiting for. However the only fight that’s even more dramatic than the one between SuperDoom and Diana is the one that Superman is having with himself. It’s this point in the issue where Soule’s genius really shines through and allows his team of artists (Featuring Benes, Daniel, Alixe, Richards, and Herbert) to illustrate a very dramatic sequence where Clark Kent and Doomsday are battling for control of Superman. Soule captures the intensity of Superman’s internal struggle while still incorporating some humor into the dialogue which makes for one of my favorite scenes throughout this whole series to date. Superman/Wonder Woman has been one of my favorite New 52 series and it’s because it produces issues like this. Soule’s writing with the incredible artwork makes for one of the best superhero comics out there, and this one is able to incorporate a large amount of those heroes. It’s an exciting read ‘til the very last page and that’s where Soule takes it a step further. A crazy end for a crazy good issue.